This won’t be an extensive technical dissertation, but I thought I’d revisit the last essay I posted and look at the processing behind the images. Because this topic remains at the forefront of most questions I get. In this case, there were a couple of questions regarding the very prominent greens in the series—namely if they’d been altered through some sort of secret incantation. 1. Personalization of tone—which leads to subtle shifts in the overall character of an image. 2. Localized adjustments—which alters or corrects the balance of various areas and how they’ll impact the viewer. 3. Distance from the moment. This last one should actually be #1 because, in my book, it is by far the most important aspect of post-processing work: the ability to step back and see an image as a standalone object, on its own or within the context of a connected series. This is the moment of reflection where we give meaning to whatever impulse triggered an image’s capture—what Ansel Adams famously called the "performance" to the negative’s "score". But I’d go even further: with the tools at our disposal today, that initial photograph isn’t even a score anymore—hell, it’s not even a negative is it? Because a score implies a slow, painstaking amount of mostly abstract work, which was part of Adams’ reality but isn’t at all true for us in the digital age. Ours is a symbiotic relationship, part reactive and part deliberate but always a partnership with machines that have been highly perfected to assist us in every way. We’re guides now, much more than engineers, pushing our cameras in this or that way...and the speed at which it all happens would’ve made Ansel Adam’s head spin. Today’s negative—the file—is much more of a jazz improvisation than a score. In most cases—even with photographic work that’s extremely cerebral and prepared—our tools bring us way beyond musical notation. We’re hearing the sounds and reacting in real time. For me the file is the jam, the output is the album. What stands in between is mixing and mastering—which is all about the careful positioning of every element to make the whole stronger and more effective. Sometimes it’s just about EQ and reverb. When we think about colour, about modifying it in some way, the reflex is to hit the Saturation or Vibrancy sliders or White Balance or...various dedicated colour tools. But colour reacts very dramatically to exposure and contrast. Namely, any S-curve applied to RGB channels (as opposed to Luminance which is also available in Capture One*) will immediately push saturation like crazy, usually forcing to compensate the other way. 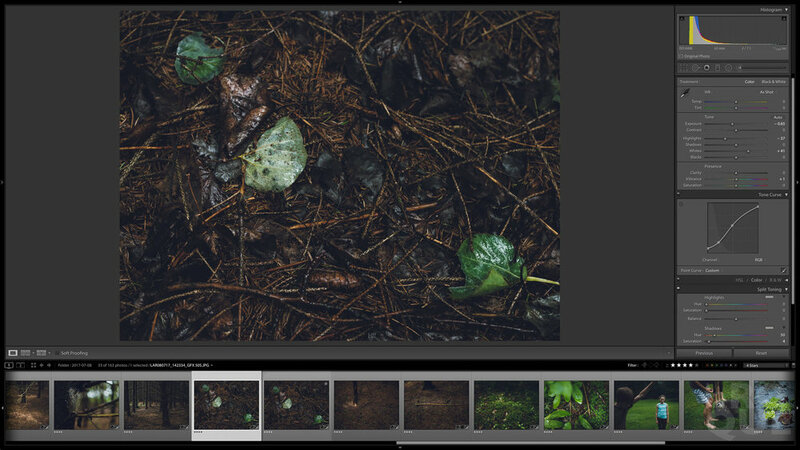 So my very first step with any image is to define exposure: meaning everything in Lightroom’s Basic panel. In the following before and after example, you can see the effect of this panel has already changed the overall look of the image. Only now—with global density and contrast adjusted—can colour be tweaked and refined as needed. I’ll often adjust Vibrancy as a less extreme way of pushing or pulling saturation. In this case, both colour sliders were mostly left untouched. You'll notice I've adjusted contrast using a combination of the Exposure and White sliders as opposed to the actual Contrast slider: that’s because Contrast affects both black and white points simultaneously, which is not always the best way to go. Lowering Exposure creates a certain gloom while pushing White acts almost as a brightness control that brings back some "air". It’s important to note that all of these choices are due to the very dull and gray light of that day—had it been sunny, the colour and tones in the files would’ve been vastly different, asking for another approach at the processing stage. Nothing is ever the same. When working with series of images it’s important to keep in mind how each one flows in relation to the next. Visual uniformity helps create a sense of continuity that, in turn, affects a story’s narrative. 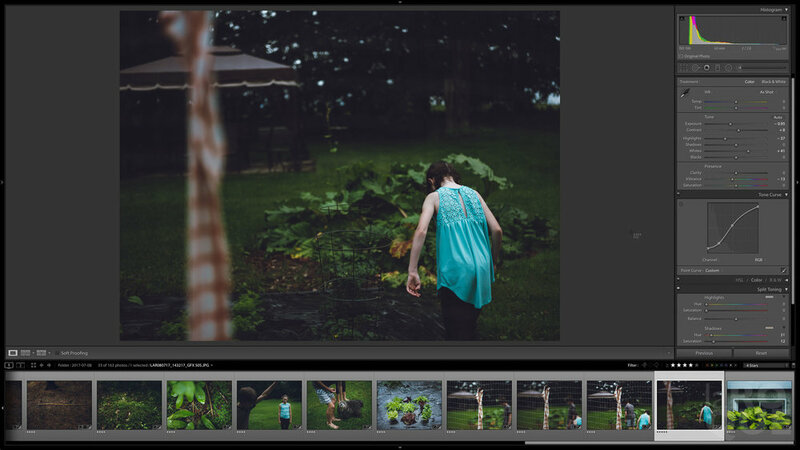 Remaining aware of this is important as images are being processed but I always like to look at selects side by side before exporting final versions. I’ll often find small variations in tone and colour that merit fine-tuning. One of the not so obvious tools I use to do this (in Lightroom*) is the Split-Toning panel. Adding a tiny bit of tone to the shadows—more or less depending on each individual image—can be a surprisingly effective way to pull a series together. In this case, I used a small amount of warmth but: a global copy/paste won’t necessarily work. One image may need more green while another may lean to red or yellow. Uniformity doesn’t mean using the same settings on all images, it means using settings that push each one in the right direction. All of these were shot with the GFX 50S...and they’re JPEG files. So all this processing has been accomplished not on RAFs but on in-camera JPEGs, shot with the Classic Chrome film simulation. Would raw files have allowed for more extensive manipulations? Of course. A JPEG is a limited object. But it also contains an initial personality we can quickly build on if we’ve exposed correctly (read: correct for a particular image*). And let me say this again in case someone is visiting for the first time: yes, I do shoot raw as well. But personal work is probably close to 98% JPEG with all Fuji cameras...processed similarly. I hope this has been useful. Hit me in the comments or email if you have any questions. 1. Maybe in 2025 Adobe? Sheesh. 2. Anyone using Capture One will know its colour wheels, levels and curves run circles around Lightroom’s options. Yes, RGB curves exist in Lightroom and they do offer added possibilities which I’ll write about at some point. This still pales in contrast with the C1 tools. But apparently Adobe is running a survey because they’ve just noticed Lightroom has speed issues...good god. </snark. 3. There is no such thing as a good or bad histogram that applies to every situation. Burnt highlights or blocked shadows can be highly effective if that’s what an image needs. The camera always steers towards the middle...it’s our job to tell it where to go.